MORE THAN S’MORES A trip to France changed how Sonoma Brands’ Jon Sebastiani thinks of these odd puffy concoctions. The marshmallow could use a reboot. It's squat, white, soft and kinda boring. It comes into play with s'mores, Rice Krispies treats, hot chocolate and Rocky Road ice cream. That's about it. Food entrepreneur Jon Sebastiani is reimagining the humble marshmallow as a gourmet snack. He calls it Smashmallow. Sebastiani got the idea in France. "When I was traveling in Paris, I noticed that artisan bakers would use marshmallows as a decadent, stand-alone snack, as opposed to the American way of sticking them in a s'more or Rice Krispies recipe," he says. "That's when I knew that we could reintroduce the marshmallow in a fun and flavorful way to the American marketplace." Sebastiani is the founder of Sonoma Brands, a consumer product incubator and venture fund responsible for, among others, Krave beef jerky. With Krave, the game plan was to take a familiar snack and reinvent it with better ingredients and repackage it with clever graphics. In Smashmallow's case, the product's vibrant website and packaging tries to cast a wider net, capturing sweet-toothed kids and comfort-seeking adults. "There's usually just one flavor with a marshmallow: vanilla," says Sebastiani. "I wanted to start with fun and nostalgic flavors that were approachable and kid-friendly." The selection was built with a sophisticated palate in mind, with flavors like lemon and poppy seed, toasted coconut and pineapple, cinnamon churro, mocha chip and more. The flavors are delicate and not at all artificial. Textural additions, like crunchy poppy seeds, cinnamon sugar and coconut chips, accent the pillowy texture of the cubes. Smashmallow is made with non-GMO ingredients and organic sugar. "At a commercial level, it's extremely difficult to create marshmallows from scratch," says Sebastiani, "and the machinery and equipment that are used in the marshmallow space were actually unable to produce the experience we required—fun inclusions and layers of flavor. This was actually our biggest challenge." The result was finally achieved with a proprietary formula combining organic cane sugar, tapioca syrup, gelatin, corn starch and flavor concentrates. Isn't that getting a little close to health-food territory? "It's not," Sebastiani says, "but we believe Smashmallow is a better-for-you alternative to other junk-filled cookies, brownies and candy." 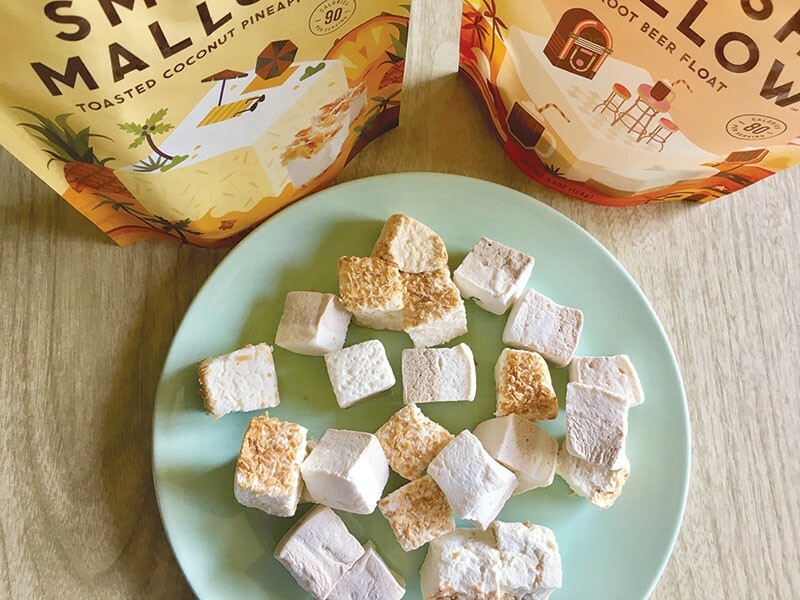 While the year-old Smashmallow is aiming high, with placement in the Safeway chain and a busy schedule of national trade shows, Sebastiani cares deeply about the brand's Sonoma County roots. He lives in Sonoma, and the offices are located in the city's downtown. "At Sonoma Brands we hope to propel food entrepreneurship in this region that is inspired by food and wine." he says. "I grew up in the wine business—so flavor research and brand development to create a story of differentiation is a part of me. Sonoma is a region rich in culinary tradition and that absolutely impacts my work." For more info, check out smashmallow.com.